Acetes Travel package tours combine these spectacular attractions with quality dining and accommodation, and you will travel on luxury tour suppliers. An experienced Tour Guide will share with you their intimate knowledge of each citys avenues, monuments, restaurants and neighborhoods. Start from Istanbul and continue to Ankara, the heart of ancient civilizations and the location of the Anitkabir, the mausoleum of the founder of the Turkish republic, Mustafa Kemal Ataturk. Visit the ancient capital of the Hittite Empire Hattusas. 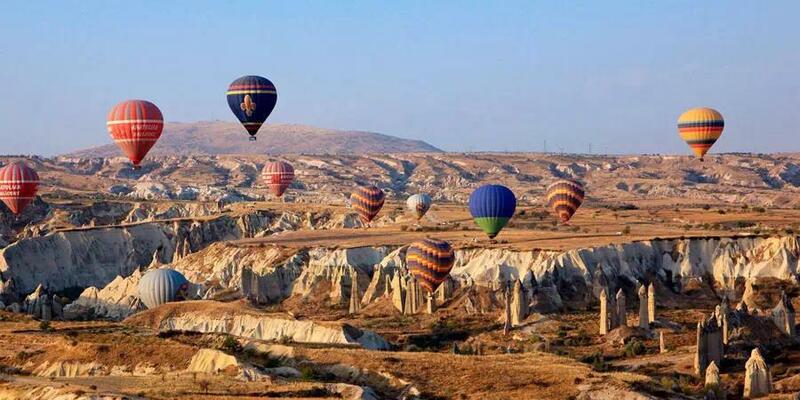 Cappadocia will feel like you have journeyed to another planet with its lunar landscape and exotic rock formations. 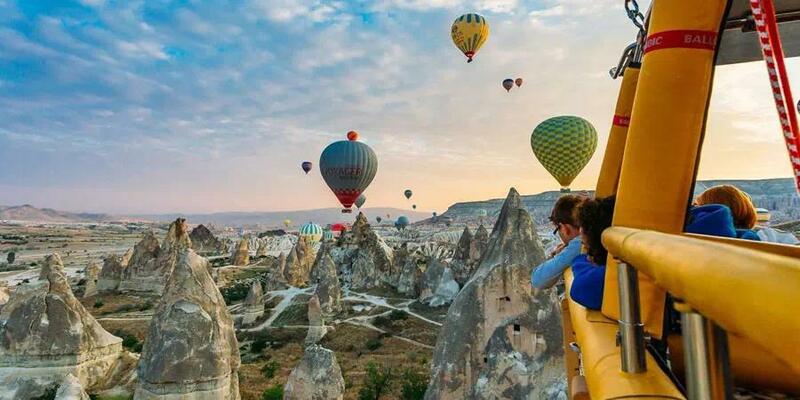 You can take it all in from the heights in a Cappadocia hot air balloon. Also, you will get to enjoy locally produced wines and see traditional Turkish carpet making in action. Konya is the center of Mevlana Celladdin Rumi and his whirling dervishes. 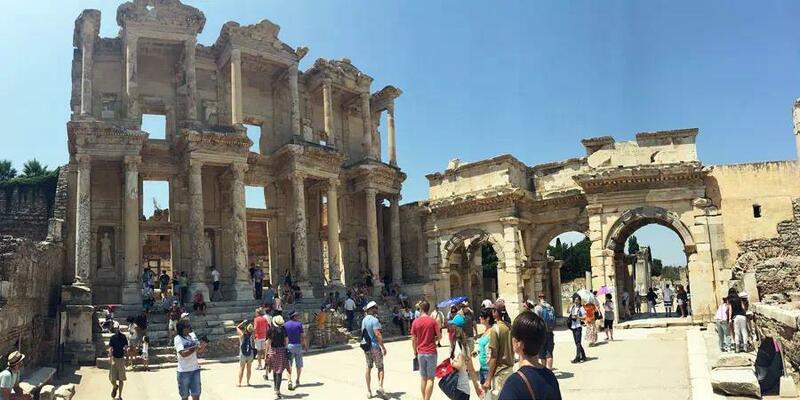 Then to Pamukkale, the Cotton Castle, followed by Ephesus Ancient City, the House of Virgin Mary, the Temple of Artemis, and the Basilica of St John. Lastly we will stop in Bursa to see the Ulu Camii and the Bursa Silk Bazaar. Arrival in Turkey Istanbul and meeting at the airport, transfer to the hotel. Check out from the hotel and transfer to airport forthe flight to Ankara. Visit to the Museum of Anatolian Civilizations. It is one of the most beautiful and richest museums in the world.In this museum you may see many fine examples from the sites of the all civilizations of Anatolia. The exhibits are arranged chronologically, from Paleolithic Age until today. Tour continues with a visit to the Mausoleum of Ataturk (Anitkabir). Mustafa Kemal Ataturk is the founder of Turkish Republic and he never requested a monumental tomb for himself. After his deathTurkish people built the Mausoleum for him to show their adoration and respect.The mausoleum includes statues, inscriptions and reliefs on topics from Turkish history and Ataturk’s life. Drive to Cappadocia. On the way stop at the Salt Lake. After arriving in Cappadocia, visit Ihlara Valley and Derinkuyu Underground City. First we will visit Devrent (Imagination) Valley to see the lunar landscape and fantastic rock formations. After breakfast, check out from the hotel and drive to Sultanhan Caravansary It is the biggest caravansary in Turkey. It was the place where traders rested on the Silk Road. Drive to Konya. 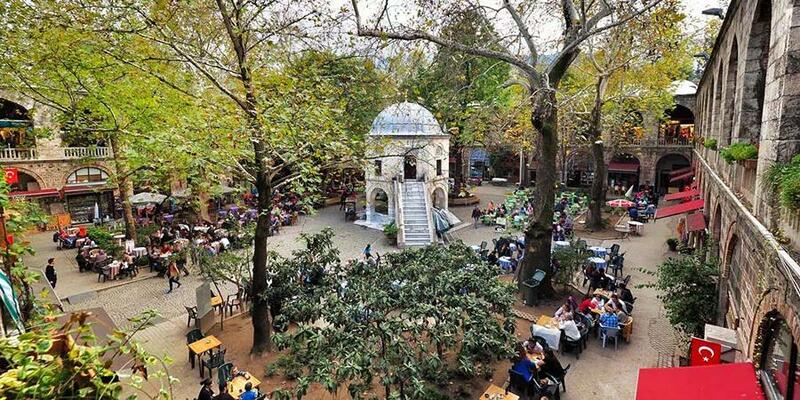 After lunch visit The Museum of Mevlana Jelaleddin Rumi. Mevlana was a great poet and philosopher who lived in the 13th century. He was the founder of Sufism and the whirling dervish ceremony. Drive to Pamukkale. Overnight Pamukkale. 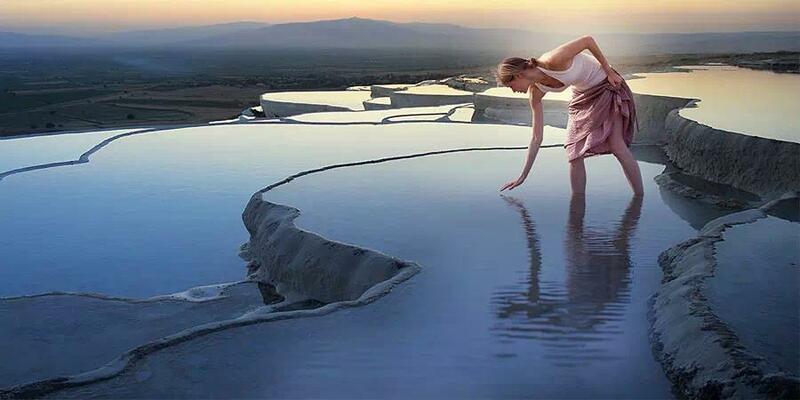 Check out from the hotel and visit Pamukkale. 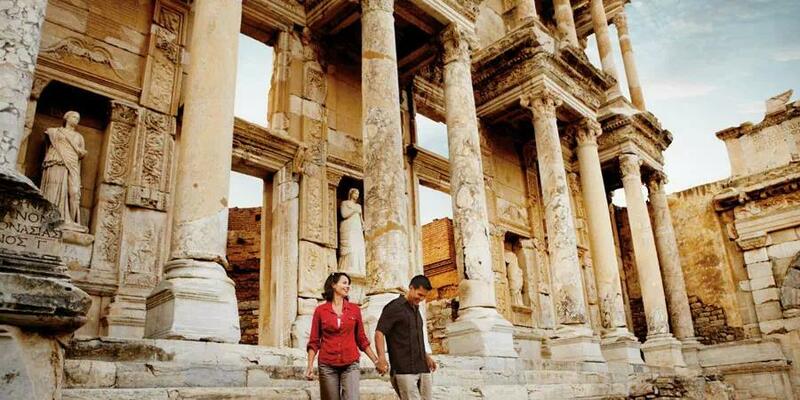 Visit the travertine terraces and the ancient city of Hierapolis. The terraces were formed by hot spring water flowing over the surface and down the hill. These are different colors and shapes in the form of terraces with pools. Pamukkale, which means cotton castle, takes its name from these formations. After tour drive to Kusadasi and check into the hotel. 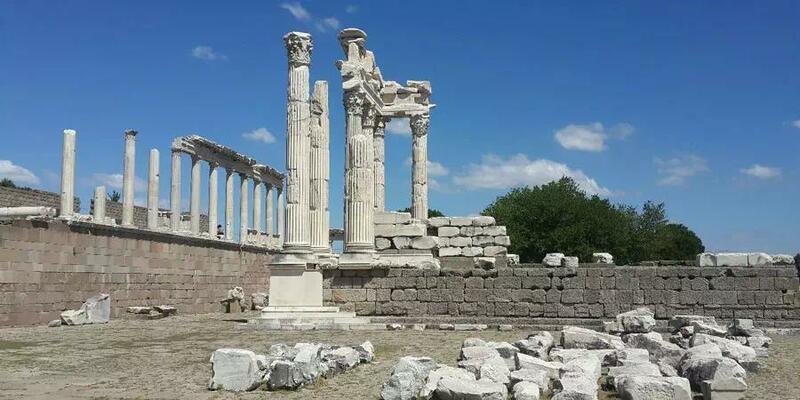 Check out from the hotel and drive to Ephesus. Visit the House of the Virgin Mary. The Virgin Mary was brought here by St. John after Jesus' crucifixion and lived her final years near the city of Ephesus on an isolated mountaintop. It has been designated a pilgrimage site by the Pope. Drive to Bursa. Overnight in Bursa. Check out from hotel. 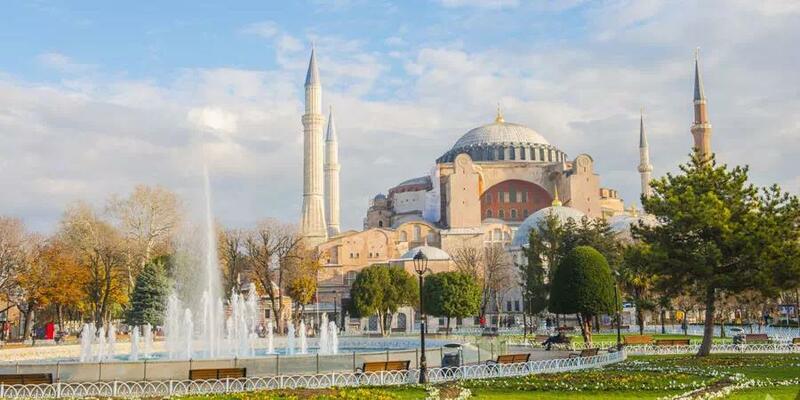 Visit the Ottoman Mosques and the Bursa Ulu Mosque, the Silk Market and other sights. After Lunch drive to Istanbul. Today we will go to the Istanbul Bosphorus. First, we will visit the Egyptian Spice Market. It was built in 1664 as part of the Yeni Cami complex. Today, you may buy spices and Turkish delight. The tour continues to the Galata Bridge and Golden Horn. We will visit the incredible 19th century Dolmabahce Palace. The palace was built by Sultan Abdulmecid. It consists of 285 rooms and 46 halls that house approximately 600 paintings. We continue up the Bosporus and cross over to Asia, going up Camlica Hill for a view of Istanbul. Transfer to the airport for your departure from Turkey. Transfers to and from hotels and airports. Transportation in a comfortable, air conditioned, non-smoking car/van with professional driver. Professional and experienced, licensed, English-speaking guide.